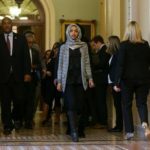 When Islamist U.S. Congresswoman Rashida Tlaib blotted out Israel on her Congressional map, and replaced Israel with imaginary “Palestine,” Tlaib suffered no consequences, and no loss of her committee assignments for her attempt to virtually extinguish the Jewish state – or for any of her other hateful actions, positions and lies. However, when Jewish Democratic NY City Councilman Kalman Yeger recently truthfully stated that a State of “Palestine does not exist” and that “there is no state by that name,” New York City Mayor Bill DeBlasio wrongly demanded that Yeger apologize simply for telling the truth. Egregiously, Mayor DeBlasio also made an Anti-Jewish threat to remove Councilman Yeger from his Immigration Committee assignment – again, simply because Councilman Yeger told the truth. Why is Mayor DeBlasio supporting an Arab/Islamist lie and condemning a Jewish truth? There has never been a state of “Palestine.” “Palestine” is a Roman name; not an Arab one. There were no Palestinian Kings or Queens. After the Roman conquest of what had been the centuries-long Jewish kingdoms, the Romans renamed the area “Palestina” in attempt to de-Judaize it. There was no “Palestinian state.” Moreover, “Palestinians” meant “Jews” up through the 1960s, when Arab propagandists and Arab terrorists groups usurped the name. Israel’s “Jerusalem Post” was previously called the Palestine Post. The Israel Philharmonic Orchestra was previously called the “Palestine Orchestra.” The Jewish characters in “Exodus” called themselves “Palestinians.” And so on. Please call, email and/or tweet Mayor DeBlasio’s office to let him know that the mayor’s threats and demands are wrong and inappropriate. 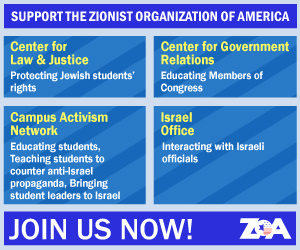 Please copy ZOA at [email protected] and please forward to us any response you receive. Many thanks! Dear Mayor DeBlasio: Councilman Kalman Yeger is correct. You are wrong! There is no state of “Palestine” and there has never been one. It is outrageous for you to demand an apology from Councilman Yeger for simply telling the truth, and for you to threaten to remove Councilman Yeger’s committee assignment. I urge you to retract your outrageous demand and threat.